Blue Orange Games is all about hot toys and a cool planet! These award-winning games are designed to be simple, fun, and are environmentally sustainable too! Blue Orange select durable, feel-good materials to create games that last through the generations, and pledge to plant two trees for every one used in their games. How’s that for commitment to the planet? 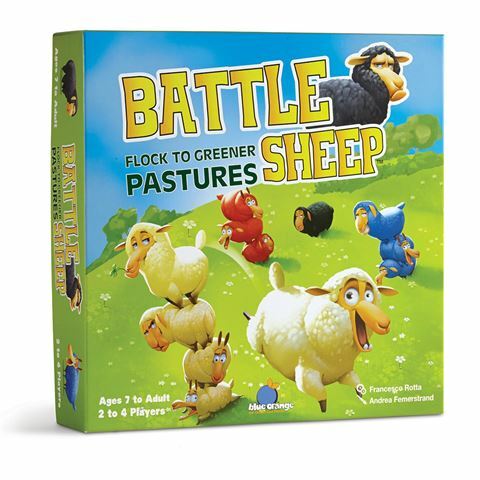 Now that you’ve made an earth-friendly choice, you just have to choose from Blue Orange’s fun game titles; Battle Sheep will have you moving herds about the game tiles in a strategic way, so that you can dominate the greatest number of greener pastures. To play, all herds start in their own bordering pasture – each herd is then split and moved to a new pasture, moving as far as they can in a straight, unblocked line. You’ll need to figure out how many sheep to move every turn, not only so that you can claim as many pastures as possible, but also fence out other herds! The grass really is greener on the other side – you just have to get there first. Suitable for 2 to 4 players. Lead your sheep in to battle and fence out the rivalling herds! Conquer the most pastures to win this fast-moving strategy game. All herds start in their own bordering pasture, and then are split to move about the tiles in a straight, unblocked line. Block other herds from taking over more pastures along the way. Occupy the most pastures to win! 16 x Red Sheep Chips. 16 x Black Sheep Chips. 16 x Blue Sheep Chips. 16 x White Sheep Chips.